I can reassure you that the year is, indeed, 2017. As time goes on the events of the past–World War II, the Civil Rights Movement to name an iconic few–grow farther from us and we find ourselves having to reach into our memories or a Google search to let us know when these things happened, how many years ago they were. That temporal distance has to be comforting because it’s a reminder that, yes, we are in 2017 and, yes, we are nothing like our past. We have overcome. The year is, indeed, 2017, but the past and the present are not separate things. Perhaps that is an epiphany of its own kind, but I want to ask you to please put aside that realization for another. I want you to understand that members of the Black community in Charlottesville and attending UVa were born and are living in a world in which past and present are one in the same. There is no chance for us to be shocked. There is no room for us to grieve at the gross repetition of the past. On the weekend of August 11th and 12th white nationalists and the self-titled “alt-right” stormed through UVa grounds ahead of the “Unite the Right” rally, carrying tiki torches and shouting abhorrent messages such as “blood and soil” and “Jews will not replace us,” stark reminders of a Nazi-infested past. 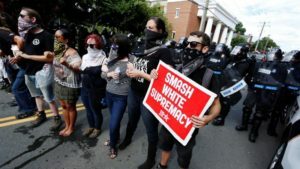 On August 12th white nationalists and Neo-Nazis rioted in downtown Charlottesville, clashing with counter-protesters, attacking a young Black man and driving a car into a group of protestors that ultimately took the life of Heather Hayer. We were not surprised. We knew what a Trump presidency would bring us–besides his own racist agendas, he became the king of the groups who have deemed Black Americans unworthy, as if slaves did not build America from the ground up. And instead of condemning these groups for their hatred, he rescinded his previous comments and in turn demonized the people who fought for equality. Even then, Black America was not taken aback. So with that in mind, I ask you to understand that while all of us are mourning over the August riots, while we are trying to figure out how to protest and what to protest, more has to be done. It is not enough for the 6 percent of Black students at UVa to address these issues and to seek actual change on Grounds. We need more than merely BSA making a list of demands, we need more than students protesting the established systems of white supremacy. For too long we have shouldered these burdens; no longer can you sit idly by and share a Facebook post. You have to come, you have to seek information, you have to involve yourself. Fighting against these abhorrent ideologies and events is as much a minority problem as it is a problem for white Americans. Temporal distance has made too many comfortable in their current positions. UVa is no longer the university of white people. An environment needs to be created to welcome every student of color that walks onto Grounds. It is not enough to call white nationalists “torch-bearing protesters.” Change needs to be made to ease the hearts of parents of color who are sending their children to this university and who will continue to do so in the future, wondering if their child will be safe there or if the color of their skin will bleed in the streets. The present does not have to be the past, but shock and disbelief will only make progress a longer process. Now that you’ve woken up, it is time to get to work.